← What is Digital Literacy? 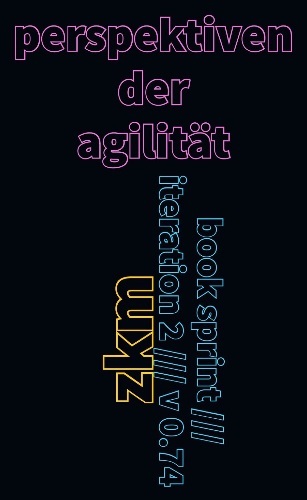 This great book on Perspectives of Agility (in German) was written over the weekend in an agile book sprint by a group in Karlsruhe, and I am following their invitation to ask ‘agile’ questions. So: How can agile methods cater to the different temperaments and styles — in particular, of those colleagues who just don’t thrive in the synchronous, live, face-to-face meetings? Our Bundesland is well-known for its tinkerers and inventors (“schwäbische Tüftler und Bastler”), and many of these need a few hours of undisturbed retreat to puzzle about a wicked problem. It is not that they were just generally slower — on the contrary. And the big advantage of a Sprint being that the short term memory is still fresh during the few days, does well apply for them, too. And they also benefit from the large whiteboards with drawings and post-its that Jake Knapp’s book “Sprint” describes like the collective working memory spanning up the rich big picture, and they also benefit from the effect of Design Thinking which Christina Wodtke so aptly put: “Move memory out of your head into the world” … “see connections”. It is just that they don’t feel optimally comfortable in the quicker oral discussion. Some people love textual online discussions which are not much slower than face-to-face — still quick enough for the short-term memory — but may be as deep as the literati’s letters of the 18c. This digitalization is still missing in the typical business meetings where the whiteboard is full of paper stickies, and the facilitator is the only one who is able to both read the details and see the overview. I am sure that a good facilitator will mitigate the discomfort of those who are often falsely referred to as ‘introverts’, and she or he may even try to get them heard among the notorious loud voices. But still, some people just don’t like the interactive rapid-fire so much as seemingly everyone else, and they would prefer to take some written and drawn stuff away into their room, and return the next day with a significant step forward. Otherwise, they may become grim enemies of the Agile and see the frequent stand-up meetings just as humilating pain. Update: See also “Extraversion und die Medienwahl von Projektmanagern” (Extraversion and Media Choice by Project Managers), via Toolblog of Jan 31. This entry was posted in Cognitive Styles. Bookmark the permalink.